A really weird thing was said about finding Polaris in the night sky. It is accurate, but certainly not the easiest way of finding the star. 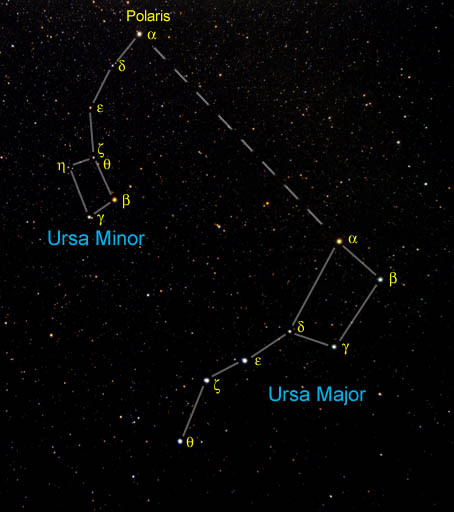 Instead of looking for the big dipper (or Ursa Major Big Bear), then looking for some single star somewhere off from the constellation, a much easier way to find the star is to look for the big dipper and the little dipper (Ursa Minor Little Bear) together in the sky. The very end of the little dipper's handle, or the tip of the tail of the little bear, is the north star (Polaris), which does line up directly with the outer wall of the dipper, or Ursa Major's shoulder. These two constellations are always visible, cloud-cover permitting, and quite obvious even in bright suburbs. So to summarize, since there are a lot of parentheses and tangents in there, the easiest way, and the way I've been finding the North Star since I was a little girl, is to find the Big Dipper and the Little Dipper in the sky. The tip of the Little Dipper's handle is the North Star, and lines up perfectly with the end of the Big Dipper's cup. If you're unfamiliar, just Google "Big Dipper Little Dipper" or "Ursa Major Ursa Minor" and you'll get hundreds of pictures of the constellations together. They're impossible to miss once you've seen them. Ha! I didn't realise that either. I've always identified Polaris by following the dotted line in the picture. I always look for the tip of Ursa Minor's handle. I can't because I live in an urban area where the light polution renders the dotted line invisible to the naked eye. So you couldn't follow the menagerie lion either. Me too. That's why I can only follow the line on the picture. Oh following him is no problem - I hear his voices all thye time and I obey them.